This auspicious coming-together of east and west took place when Purvi Parikh and Girish Sanzgiri were on tour in Europe giving workshops in Indian classical music. 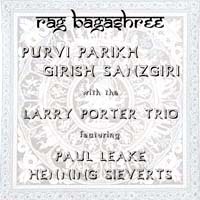 The idea was to use the traditional North Indian style of interpreting a raga, in this case Rag Bagashree, in bringing together the two vocalists and jazz piano trio with tabla. The result is rare indeed and a tribute to the openness of the musicians involved. Purvi is gifted with a melodious and sensitive voice. Intensive talim, rigorous riyaz and an introspective approach have helped to create a striking, individual style which is very appealing and superbly expressive. Purvi has had the privilege to learn music from the renowned Kirana Gharana masters: Ustad Faiyaz Ahmed Khan and Ustad Niyaz Ahmed Khan. Purvi has been travelling intensively in the past few years doing concert recitals all over India, the USA, Japan, and several European countries. Sri Arvind Parikh, the renowned sitar maestro, senior-most disciple of the legendary Ustad Vilayat Khan. 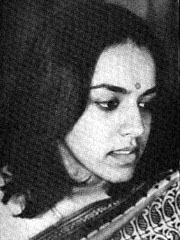 Smt Kishori Parikh, a leading exponent of the Kirana Gharana tradition. Purvi was initially interested in painting and has had a brilliant academic career throughout. Her interest in music grew gradually. Self discipline and a relentless pursuit of the sublime have tapped her potential to become a very promising musician indeed. "Out of the nine artists, holding high academic qualifications who participated in this festival and provided a feast of music, the most outstanding performance was given by Girish Sanzgiri who is a pupil of Pandit Phiroze Dastoor. He gave a mature performance in a pleasing, pliable voice with the accent on the aesthetic side of music. His diction was very clear. His serene and systematically developed raag was marked by pleasing sargams (solfa) and a variety of cascading taans (vocal "fits"), enchanting meends (glissandos). He arrived at the sama with pinpoint precision." Girish has been learning under Pandit Dastur since 1982. He started performing in concerts since 1987 apart from regularly accompanying his guru with vocal support. By profession he is a senior accounts executive in a leading Indian corporation. Girish Sanzgiri was selected to accompany Niranjan Jhaveri on his 1992 lecture/workshop tour of USA and Europe after an extensive search to pick the most talented as well as articulate artist. While he has been invited for concerts all over India, this will be his first tour overseas, during which several concert performances are scheduled.